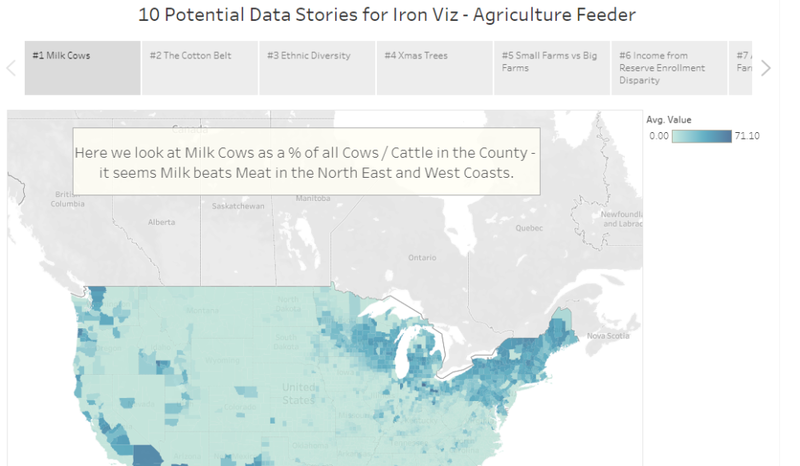 Tableau announced their Iron Viz feeder event this week, and with the new competition came a twist – everyone gets the same data! At The Information Lab we love Iron Viz, and love the fact this new rule will help level the playing field – ensuring as many people as possible can dig into the data and enter something. 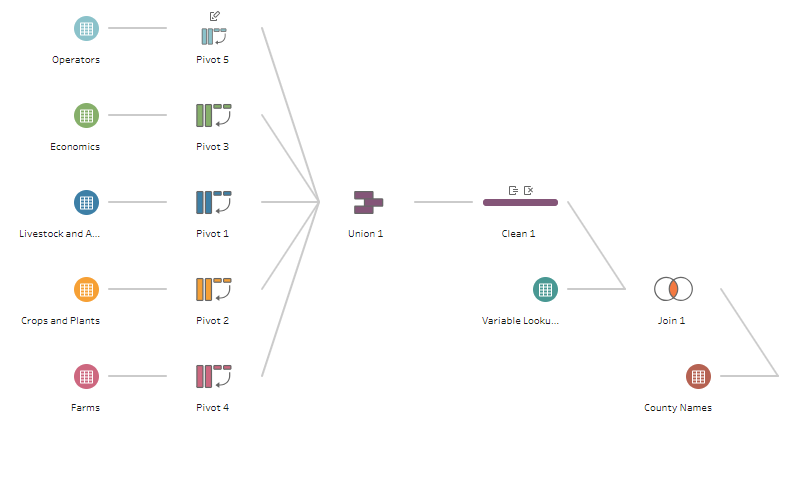 In the post below Zen Master Chris Love will walk through his workflow in Tableau Prep to prepare the data, before sharing 10 visualisations and charts to help provide some inspiration for the event. If you’d rather look for yourself then this isn’t the post for you – but if you need inspiration, help or just want to see how Chris approached his investigation then carry on reading. 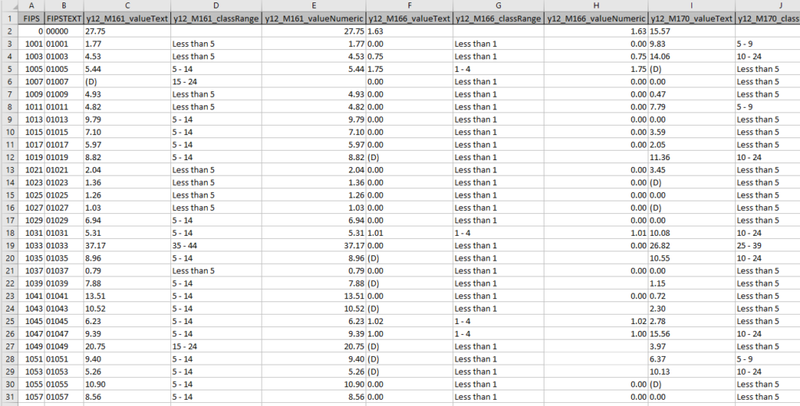 The main dataset comes in the form of an Excel file, with several tabs of data. 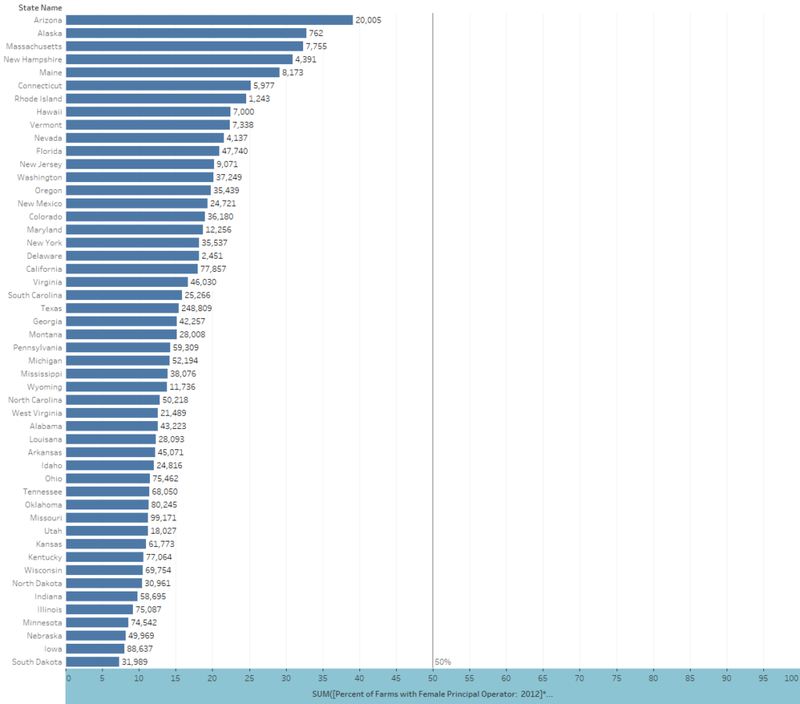 Each tab contains data from a different category with rows representing Counties in the US and each variable repeated three time (text, numeric and “class range”). 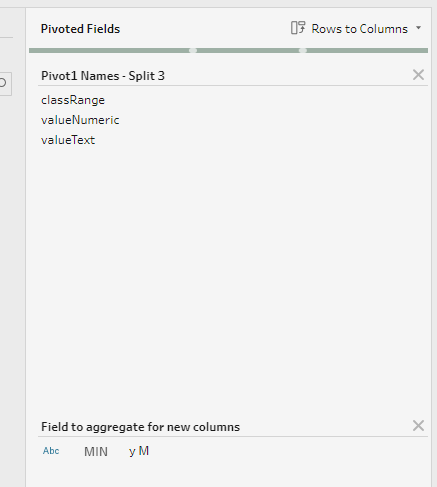 The variable names are coded – and so need to be decoded via a separate “Variable Names” lookup. 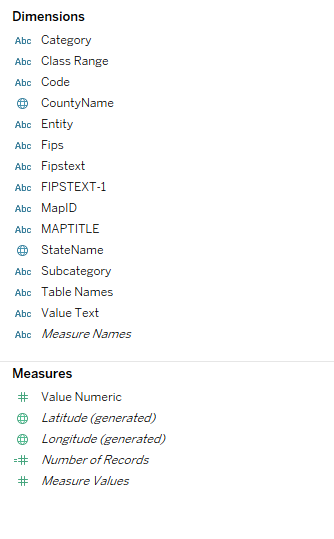 The Counties also need decoding from the “County Names” Lookup. 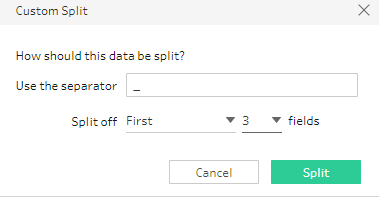 To help here we can use Tableau Prep Builder, if you don’t have a copy try the free trial on Tableau’s website. 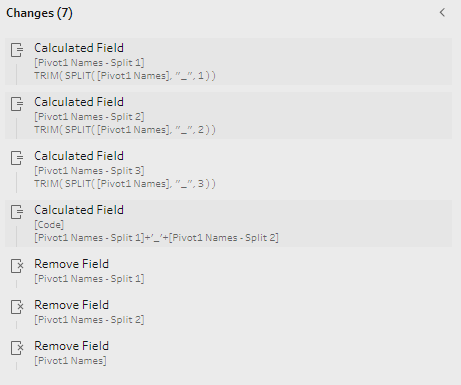 Finally we rejoin the first two in a calculated field and remove the extra fields in the same step, the full process looks as below. These two data structures helped me compare variables with each other, but also helped quickly find patterns on maps. 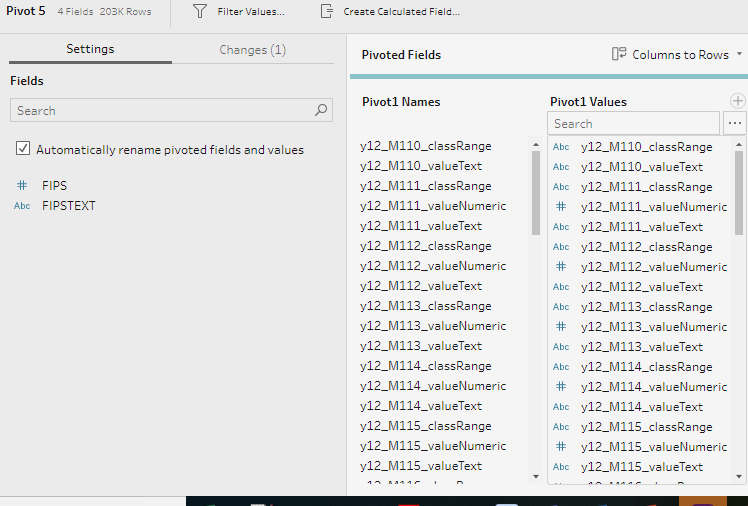 You can find my Tableau Prep workflow here. The term “Data Stories” isn’t necessarily a great term for these – they’re only the seeds of ideas to aid in the building a visualisation – but every great viz has to start somewhere. We’ve also included further questions to explore and further reading, but the data for your Viz must only be found in the two data sets provided for the contest – whether the “further questions” can be answered solely with the data provided is something we’ve not explored. Looking at the number of dairy cows against the total number of cows on the farm we see mainly populations to the North-East and West Coast. How do these counties differ? Are they heavily populated? Are these areas heavily dairy farmed? Can we find data in the dataset on how they’ve changed since 2007? Cotton is grown (as a % of the crops grown in acres) in a very distinctive swath across the US. 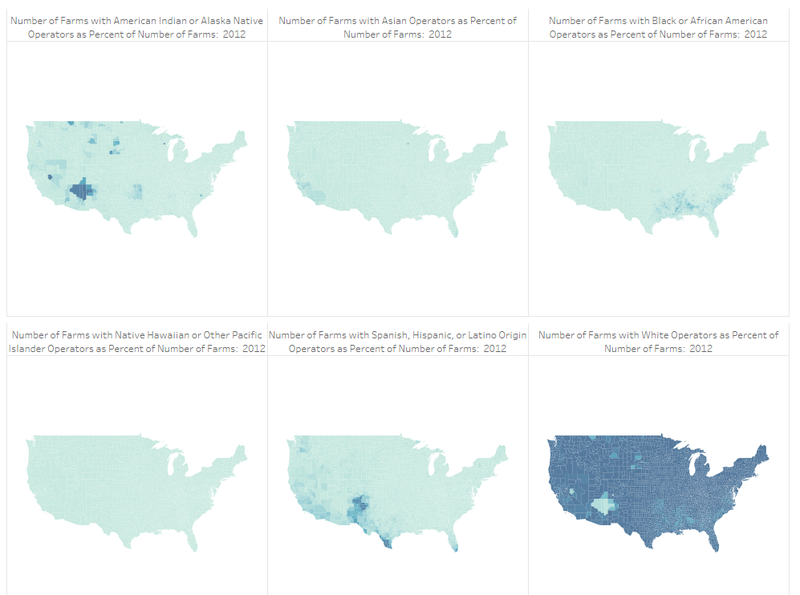 Operators of farms are VERY White by the looks of the data. There’s an interesting American Indian patch and some patches of Hispanic and Black / African American Ownership in certain areas that could be explored. Does the data show any differences between counties with high proportions of ethnic minority owners? Is there evidence of discrimination? Are there interesting data led stories focused on these areas? 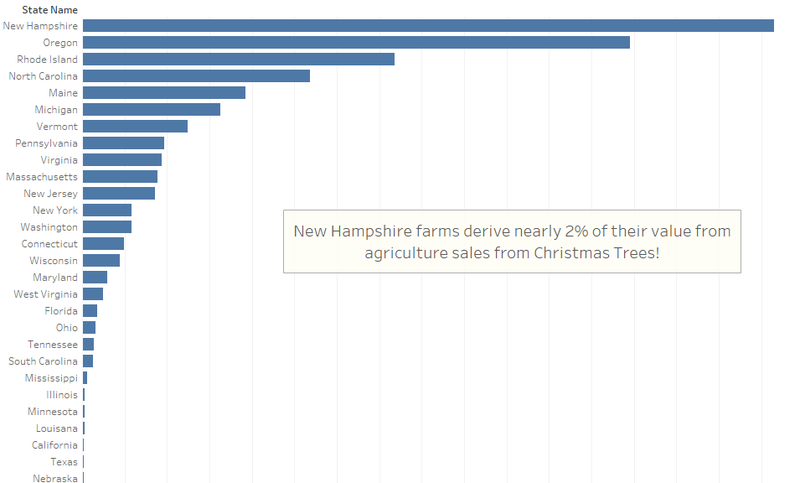 New Hampshire farms derive 2% of sales from agriculture from Christmas Trees! Why New Hampshire? What effect does this have on the farms? Is it seasonal? 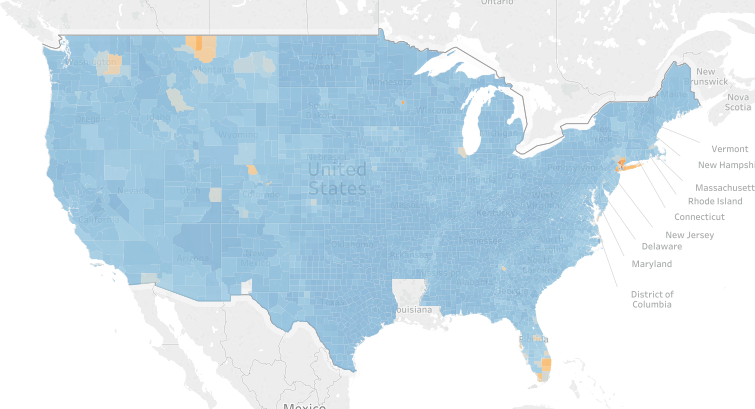 How do farms in these counties differ from others? Looking at data at State level when working with percentages needs special care, we need to calculate an appropriate measure for each county so we can aggregate. 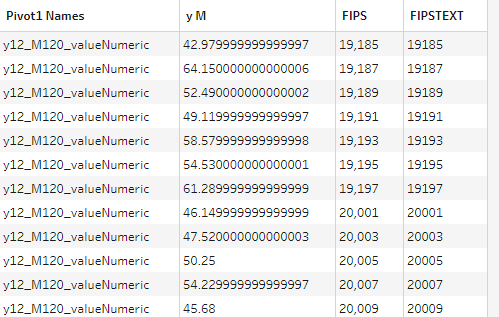 Here the value at County level is the % of the total Agricultural sales, so we need to multiple the % by the totals to work out the actual value, before summing to State and then dividing by the summed total again. 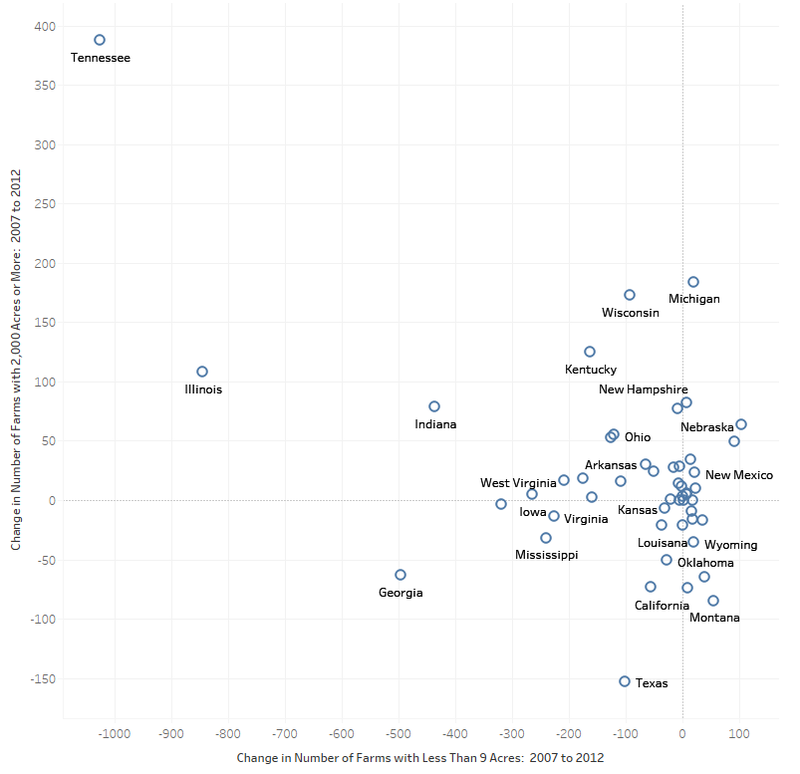 If we look at the closures of smaller farms compared to bigger farms we’ll see one big outlier in Tennessee. Whats so special about Tennessee? How do these farms differ? Are big corporates now owning them? Have they changed what they grow? 6. Fair payments for Reserves? Farms can enroll acres in reserves and wildlife schemes for which they receive money, but some states benefit more per acre than others. North Dakota seems to particular get a raw deal. Why North Dakota? Any interesting data points in the worse off vs the better off? How do the counties these farms are in look? Again like previous examples State level analysis needs weighted averages. Some States farmers are much older on average. 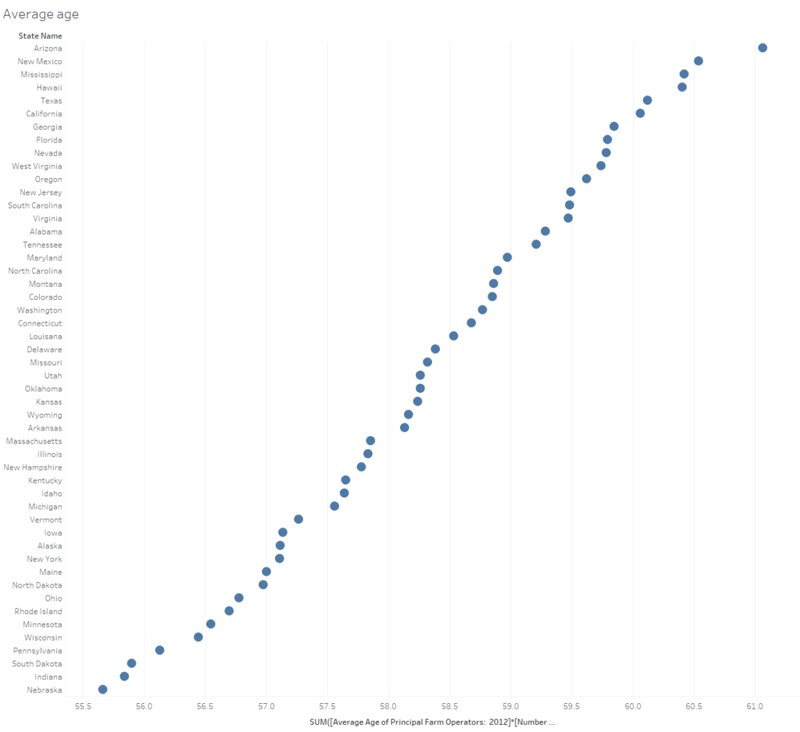 Whats special about farms in counties with an older average age? Are some farms at risk of dying out due to a lack of a younger generation? Counties where Corporations own > 25% of farms are rare, but there are certain geographies that have high rates of corparate ownership. What is different about these counties and their farms? 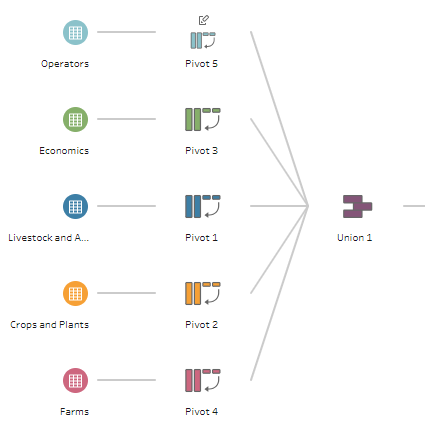 Are corporate farms different? Is there a trend over time (data might be a problem)? Female farm operators don’t manage close to 50% ownership anywhere in the US at State level, although some counties do well. 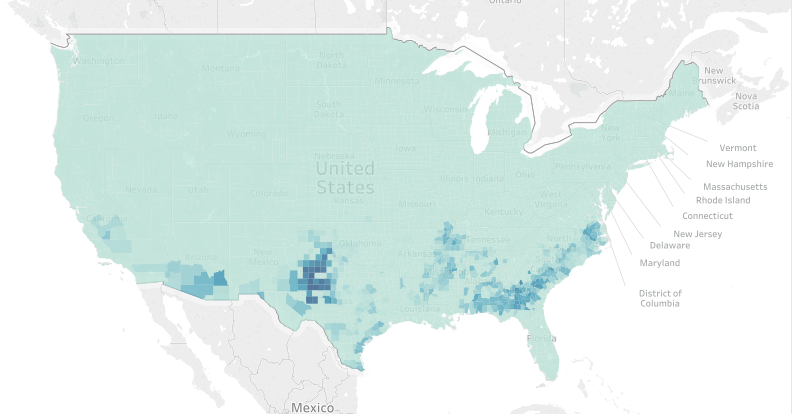 How do farms in these high proportion States / Counties differ? Are the States doing anything to increase the number of female operators? Do certain farms have more likelihood of female operators? As ever State level analysis of percentages needs due care – multiply by the number of farms to ensure any aggregations are weighted. 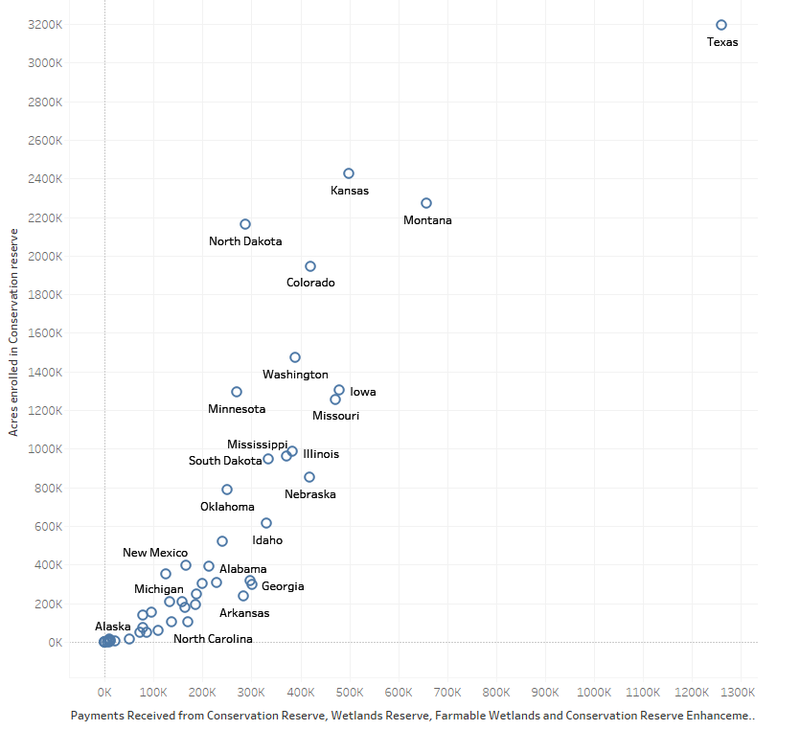 Some counties have seen huge increases / decreases in cropland acres. What’s special about these Counties? What do the farms in them look like? 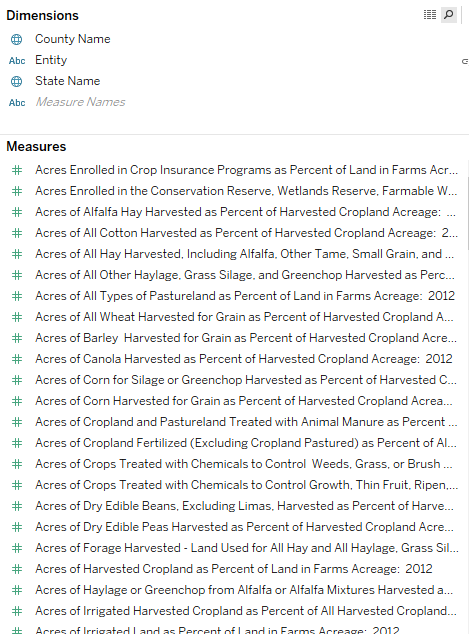 Are there any patterns in types of farms reducing crop land? Any reason? Click on the link below to find the above visualisations and datasets on Tableau Public. don’t be put off by the quality of previous entries, this feeder is a new set of rules. The data is difficult to interpret and everyone has the same data, and so it’s a level playing field. This opens the door to some great analytics and storytelling. don’t be tempted by over designed dashboards – data should be at the forefront of your visualisation. Pictures and text should support and add weight to your visualisation. If your visualisation doesn’t need a picture then lose it – less is more. the “story telling” component of the story might lead you to imagine you need to guide the user through a story that you found in the data. That’s one way, but often the best data stories are ones that affect us personally. Why not have the viewer select their location, and their favourite foods / crops – then build a story around that? you don’t need to aim to win Iron Viz to enter. If you’ve ever entered any race from a marathon to a 5k you probably didn’t expect to win. The joy of Iron Viz is in the training, the participation and the finish. Don’t be dismayed and put off if you see others with better visualisations, or with more Twitter likes – the judges are often looking at different things than what gets attention on Twitter. get feedback – there’s nothing in the rules about asking for help online and improving your viz based on comments. Use that collective knowledge.